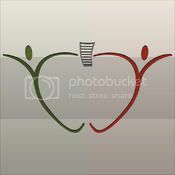 [dropcap]M[/dropcap] y favorite time of the school year is when those kids first walk through the classroom door. To see those eager faces as they walk into the room and nervously look around is priceless. And it’s not just the students who are eager to begin, so am I, the teacher. One of my goals has always been to set children up for a great beginning. I want my students to feel wanted and welcomed and to know I care about them and will be there to support them and help them succeed. This, I feel, is an essential element to a successful school year. Therefore, my efforts actually begin weeks prior to that first day. I usually receive a preliminary class list about three weeks before school begins. One of my first tasks is to generate a welcome letter. Since I have access to a basic photo of each child, I use those photos to construct a border for the letter. 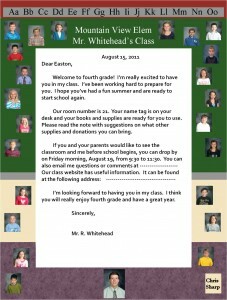 This way, students not only read a great welcoming letter, but also see who their classmates will be. The letter is mailed. Certainly it’s much easier to email the letter to the parents who can then share it with their children. But there is something very special about actually receiving a physical letter in the mail. 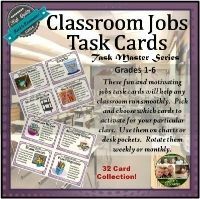 The children realize it takes extra effort and money to mail letters and they begin to appreciate and build a bond with the teacher even before the school year begins. Most kids rarely receive mail; in fact, some have never received a letter at all. So, when it happens, it becomes an event that is remembered for years. The letter includes an invitation for the children and their parents to attend an optional open house in the classroom a couple of days prior to the start. Students can meet the teacher and see the classroom and ask any questions they desire. They can see where they sit and what books and supplies are provided. It’s a good opportunity for me to begin building rapport with parents as well. A link to the classroom website is included in the welcome letter. 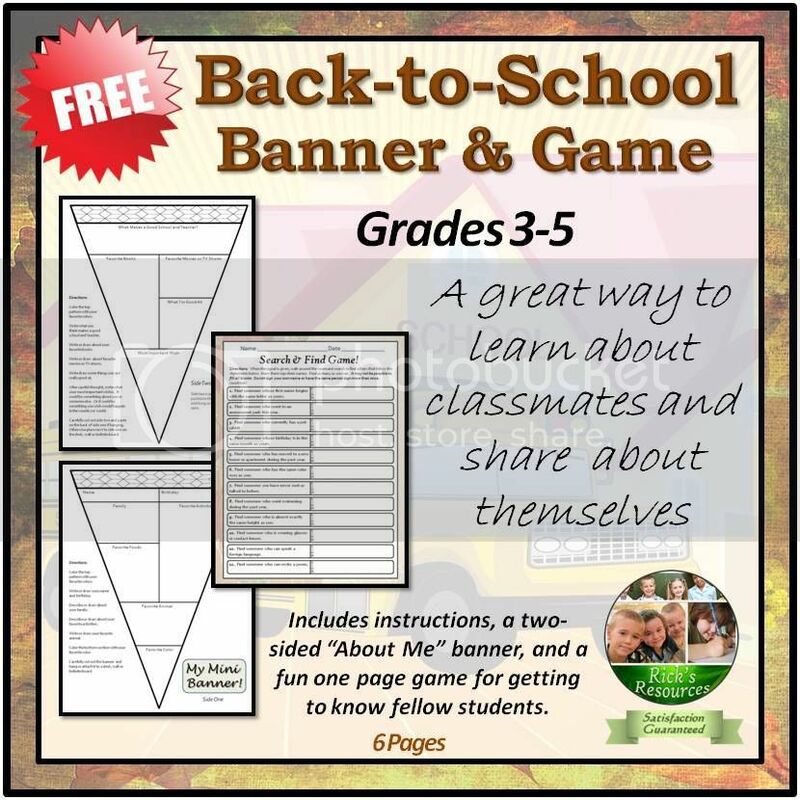 Included on the website are all kinds of informational articles and suggestions for the school year as well as photos and videos of activities. I create and post a class trailer that students can watch to get excited for the new school year. These type of activities help students feel welcome and excited for school to begin. One of my favorite bulletin boards is one comprised of a large wanted poster in the style of the Old West wanted posters. 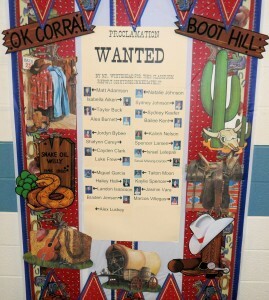 Students have their photos and names placed on the poster under a large “Wanted For This Classroom” sign. The students love seeing their photos and names on the board and knowing they are welcome and wanted for the classroom. Beginning of the year bulletin board. Helping students feel welcome and wanted is likely one of the most important goals for any teacher. Doing so relieves student anxiety and stress and helps set the tone for the entire school year. I wish all of you teachers the very best as you begin yet another wonderful school year. The Wanted Bulletin Board is one of the many resources available at Rick’s Resources TpT Marketplace store. Just click the image below to be taken to the download page.